OMG, that is early! 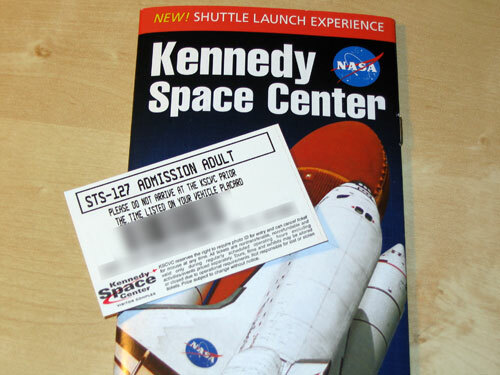 Our hotel is about 45 minutes from the entrance to Kennedy Space Center, so we’re going to need to leave our hotel at least by 1:30 AM but probably earlier to be safe. The paperwork advises to allow double driving times as roads leading to KSC are packed on launch days. Fortunately you are allowed to bring folding chairs (only ones that go in a shoulder bag), so we’ll be able to sit. I’m sure it’ll be a magnificent view of the launch pad which will all be lit up at night. And we’ll see the sun come up as we’re sitting there in the middle of a huge nature reserve. It’ll be great! 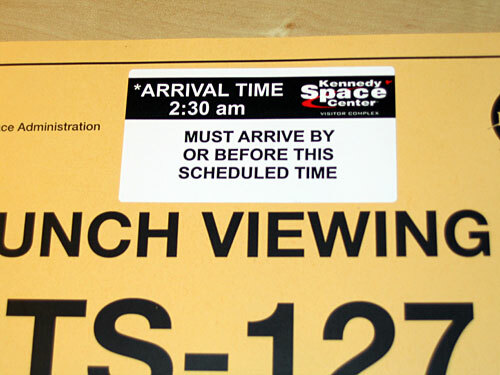 What is strange is that our vehicle placard (above) says: “must arrive by or before this scheduled time” (2:30 AM) and the tickets (below) say: “please do not arrive at the KSCVC prior to the time listed on your vehicle placard”. So I suppose we’ll have to be there EXACTLY at 2:30 ?! This is strange. I’ll have to call about this or read the instructions better. It all seems very strict. Due to heightened security since 9/11 they don’t let people drive on the causeway with their own cars anymore. It’s all handled with buses and time slots now. This entry was posted on Sunday, May 31st, 2009 at 8:17 pm CET and is filed under Space, Travel	with tags . You can follow any responses to this entry through the RSS 2.0 feed. You can leave a response, or trackback from your own site. I have seen a launch…you will enjoy it. @Arturo: You can no longer buy tickets to see the launch of STS 127 from the NASA causeway, which is the closest viewing area. Those tickets sell out quickly. There are however other options. I’ve found the following page very useful: http://www.launchphotography.com/Shuttle_Launch_Viewing.html It looks like your next best option is along the river at Titusville.